After a short introduction into the role of this audiovisual archive, the authors, who form the core of Sound and Vision’s Information Management Team, describe how the organisation has taken up the challenge to become a trustworthy digital repository (TDR) for Dutch audiovisual cultural heritage collections. The TDR project’s outcome is an Information Model for the Digital Archive of Sound and Vision which formulates a normative answer on how to manage and preserve growing volumes of digital material in a rational and responsible way. This model combines OAIS based processes and PREMIS metadata to meet the specific situations and needs of AV files managed in a dynamic production environment. The paper describes how the combination of workflows, documenting the actions an object undergoes as well as the properties of the objects themselves result in different object types (defined as sets of essence, associated support files and metadata files) in the SIP, AIP and DIP phase. The defined preservation workflow should guarantee the authenticity and integrity of the objects in the repository, via the focus on digital provenance, including quality assurance. The next step towards the status of Trusted Digital Repository will be the certification with the Data Seal of Approval. de Jong, A, Delaney, B, & Steinmeier, D. (2013). 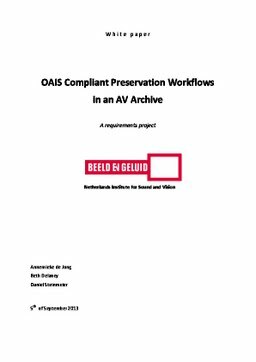 OAIS Compliant Preservation Workflows in an AV Archive: a requirements project. Netherlands Institute for Sound and Vision.